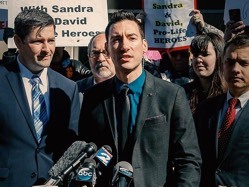 The pro-life group sparked a media firestorm in 2015 after David Daleiden and Sandra Merritt released undercover footage of Planned Parenthood officials allegedly discussing the illegal sale of aborted baby body parts. Breitbart News reported that Planned Parenthood hired Fusion GPS to conduct a "forensic analysis" to discredit the videos. Fusion GPS, although having no credentials in the field of forensic video analysis, later called the videos edited and fake. Coalfire Systems, another research firm with credentials in video forensics, said, "The video recordings are authentic and show no evidence of manipulation or editing." Liberty Counsel, a nonprofit organization that represented CMP throughout its legal battle with Planned Parenthood, says it's no surprise that Fusion GPS was involved. "The videos are shocking and reveal a callous disregard for human life," said Mat Staver, Founder and Chairman of Liberty Counsel. "It is no surprise that Planned Parenthood hired Fusion GPS to create a fake report. Fusion GPS is the same company hired by the Clinton campaign and the Democratic National Committee to produce fake news."